You may have noticed that I have remained silent on the topic of the military regime that we currently find ourselves under in Thailand. It’s not advised (read: illegal, people are being detained…) to pass comment on the current situation; well, at least negative comment, of course. So here’s my disclaimer: this is in no way taking either side of the coup/anti-coup camps. No opinion at all thank you very much – I value my ‘freedom’ far too much (‘freedom’ is all relative when you’re living under military regime…) wait, too opinionated already? Oops. I also haven’t written about it because in all honesty it has barely made any difference to my day to day life. The curfew was initially annoying when it was imposed on a weekend and dictated that all people should be inside between 10 pm and 5am (how dare the junta try and limit my social life). This was then gradually eased to 12 midnight – 4 am and finally lifted completely (one of the benefits of recently moving to a tourist destination is that those were the areas first considered when lifting the restrictions). Bangkok is still under curfew and will be the last place to be released from these controls. To be honest, I was having my own personal crises combining being cut off by the electricity company and not being reconnected for four days, failing to get a working visa because of one pesky piece of paper and my cat running away for a week of what I am sure was full of fun and frivolity but had me in a state that can only be described as full panic and hysteria as I thought she was dead. Turns out she was just being a cat but that’s a whole other blog post (and probably destined for another blog although I am holding back from starting a crazy cat lady blog quite yet). So I didn’t really notice the curfew in any way, other than if I had a craving for a 7-eleven cheese toastie, I had to hold off until morning. Not only my social life but my midnight munchies? Junta, why you do this to me?! Look at that face, how can you neglect this poor child? Other than the curfew, there is the TV and radio shut down that is still going strong for certain non-approved channels. I don’t have a TV and I don’t listen to local radio so that has no affect on me. Although I am borrowing a car this week and the only thing I seem to be able to pick up on the car radio is some easy listening awfulness punctuated with BBC world service news and Thai public service announcements about who knows what. At least my Love Duets CD featuring all the classics covered by generic Thai artists is getting some use. Of course, there is the other matter of some pretty prominent political figures being detained, the lack of active government and no sign of elections any time soon. Oh, and if five or more people congregate in public they are disturbing the peace and may be dealt with accordingly. But none of this seems to be affecting day to day life in Phuket, at least not for me. In order to soften the blow of the military coup, food prices are being fixed and VAT is being lowered. Life in Thailand is about to get even cheaper. Note, I don’t have any sources for these claims as I heard them on the aforementioned easy listening/public announcements radio station so it could all be propaganda (not that they have that kind of thing here…). Something interesting (maybe not to everyone) is that those on the anti-coup side have adopted the three finger salute from the Hunger Games, representing defiance and overcoming the powers that be. Of course, anyone who has ever been a brownie, guide, cub scout etc., will know that they have in fact adopted the international guiding and scouting salute which has a different meaning altogether including helping others, keeping your promise and being prepared. Which is nice. Maybe they can sell cookies too while they’re at it. Finally, the Army chief has written a song to make everything OK; Return Happiness to Thailand. Here it is for your enjoyment. I’ve put the English translation of the lyrics so you can get the feel for it. To bring back love, how long will it take? We will do what we promised. We are asking for a little more time. Today the nation is facing menacing danger. Sunday Papers – peace confusion, apologies and aliens. It’s Sunday morning and every week I like to cast my eyes over the morning’s papers at home and in Thailand. 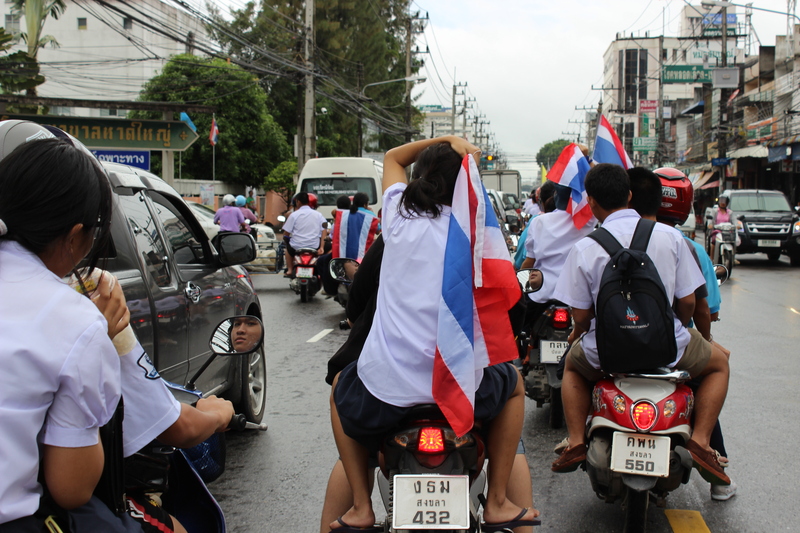 Thailand’s news is still focused on the protests which came to a (once again) violent point yesterday afternoon as tensions raise ahead of the elections taking place today. With many polling stations unable to open due to the delivery of ballot papers being obstructed and protests outside of the polling stations that have managed to open it is hard to see many people braving the frontline to cast their vote, especially with violent outbursts such as this captured on video yesterday taking place; http://www.youtube.com/watch?v=_wVmQAp13kI&sns=tw Scary stuff. On a lighter note, but still not a particularly positive light for Thailand, shopping mecca Central Festival had to release an official apology after the world of the internet brought it to their attention that maybe their advert (below) for Chinese New Year featuring a model pulling a ‘slanty eye’ maybe, just maybe, might be offensive to… the rest of the world who now have a grasp on things such as racial prejudice and the like. How many times must we tell you, Thailand?! 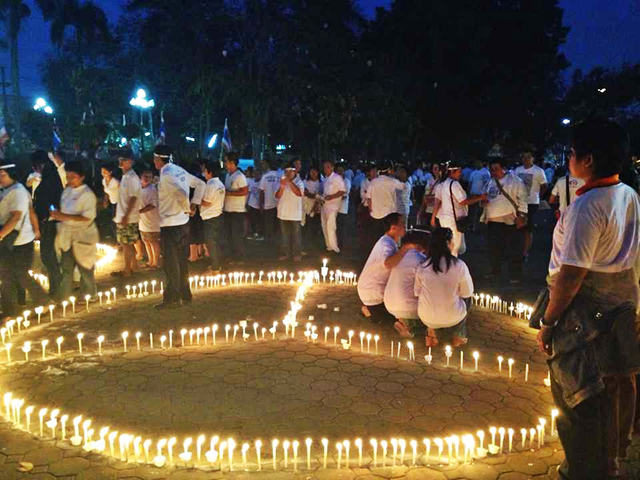 It’s not all violent protests and racism in the Land of Smiles – these lovely people had the greatest intentions, staging a candlelit vigil for peace in Thailand… only their candles seemed to be displaying the Mercedes Benz symbol rather than the peace symbol… oops. Heading over to the homeland, things of an extra-terrestrial nature are taking hold of the county of Cornwall with the alleged sighting of a UFO at Mounts Bay – which to my untrained eye is clearly a meteor. Judge it for yourself:- It comes as no surprise to me that Cornwall is the number one area in the UK for UFO spottings – there a quite a lot of strange people with a lot of time on their hands!